Face-lift surgery is a cosmetic procedure that involves removing sagging skin and tightening muscle tissue of the face and neck to counter signs of aging. The procedure is also called facialplasty, rhytidoplasty, and cervicofacial rhytidectomy. The purpose of face-lift surgery is to improve the appearance of the face by repositioning the skin and tightening some of the underlying muscle and tissue. The procedure is designed to counter sagging and looseness in skin and muscle tissue that becomes more pronounced as individuals age. Face-lift surgery will not eliminate all facial wrinkles. For example, wrinkles around the mouth and eyes may benefit little from face-lift surgery. Also, additional procedures including blepharoplasty , chemical peel, botox injections, or dermabrasion may be necessary to achieve desired results. The American Society for Aesthetic Plastic Surgery estimated that nearly 6.9 million cosmetic surgical and nonsurgical procedures were performed in the United States in 2002. The number of face-lift procedures increased by 6% from the previous year (2001). Among members of the American Academy of Cosmetic Surgery, 15,478 face-lift procedures were performed. The average fee for a face lift in 2002 was $7,000. A face lift takes about two hours and may be performed as an outpatient procedure or it may require hospitalization. General or local anesthetics will be used to sedate the patient. Typically, patients receiving local anesthesia will augment it with "twilight anesthesia," an intravenous sedative that helps to lower their awareness of the procedure being performed. An anesthesiologist will be present to administer the anesthetics and assist in monitoring and maintaining the patient's vital life functions. The surgeon makes an incision within the hairline just above the ear. The incision continues down along the front edge of the ear, around the earlobe, and then up and behind the ear extending back into the hairline. The location of this incision is designed to hide any sign of the procedure later. The same procedure is repeated on the other side of the face. The surgeon separates the skin of the face from its underlying tissue, moving down to the cheek and into the neck area and below the chin. Fat deposits over the cheeks and in the neck may be removed surgically or with liposuction at this time. The surgeon tightens certain bands of muscle and tissue that extend up from the shoulder, below the chin, and up and behind the neck. If these muscles and tissue are not tightened, the looseness and sagging appearance of the skin will return. 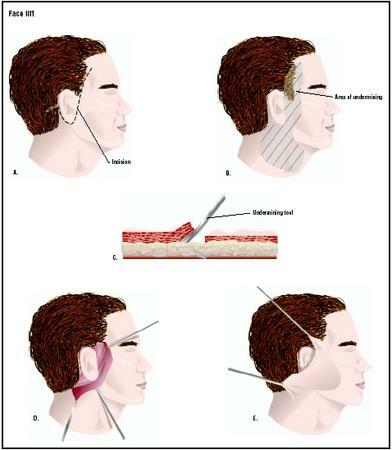 The surgeon trims excess skin from the edges of the original incision and the skin is pulled back into place. The incision is closed with sutures or staples. and to avoid exposure to passive smoke at least two weeks before and after the procedure. Some surgeons also recommend taking antibiotics prior to surgery to limit the risk of infection. Often a steroid injection is administered before or after the procedure to reduce swelling. A pressure bandage is applied to the face to reduce the risk of hematoma, which is a pocket of blood below the skin. The person may spend a few hours resting in a recovery room to ensure that no bleeding has occurred. The individual then returns home. Some surgeons recommend that people stay in a reclining position for the 24 hours immediately following surgery, consuming a liquid diet, and avoiding flexing or bending the neck. Ice packs for the first few days can help to reduce swelling and lower the risk of hematoma. Individuals continue taking antibiotics until the first stitches come out about five days after the procedure. The remaining sutures are removed seven to ten days later. Many people return to work and limited activities within two weeks of the procedure. Candidates with other medical conditions should consult with their primary care physician before undergoing a face lift. Lung problems, heart disease, and certain other conditions can lead to a higher risk of complications. Persons who use medications that affect blood clotting (including female hormones, aspirin, and some non-aspirin pain relievers) should stop taking these medications prior to surgery to lower the risk that a hematoma will form. A hematoma is the most frequent complication of face-lifts. Most hematomas form within 48 hours of surgery. The typical sign is pain or swelling affecting one side of the face but not the other. Another risk is nerve damage. Sometimes it can affect a person's ability to raise an eyebrow, or distort the smile, or result in limited sensation in the earlobe. Most of these nerve injuries, however, repair themselves within two to six months. Some swelling and bruising is normal following a face lift. There should be a noticeable improvement in the contour of the face and neck. Some fine wrinkling of the skin may be improved, but deep wrinkles are likely to require another cosmetic procedure to improve their appearance. In general, mortality and morbidity rates for forehead lifts and similar facial cosmetic procedures are very low. Almost all cases of mortality following facial cosmetic surgery involve patients who were treated for facial disfigurement because they had been severely burned or attacked by animals. Moreover, many plastic surgeons do not consider morbidity and mortality rates to be as significant as other factors in evaluating the success of facial cosmetic procedures. One group of researchers at the University of Washington maintains that "[t]he most important measures of outcome in facial cosmetic surgery are quality of life and patient satisfaction, in contrast to other, more objective measures such as complications or mortality rates." Isometric exercises are recommended as non-surgical alternatives to face-lift procedures. Injections of Botox (botulinum toxin) have been used to achieve the same results as a face lift. Botulinum toxin is a compound produced by the spores and growing cells of the organism that causes botulism, Clostridium botulinum . The toxin causes muscle paralysis. It was first used clinically in the 1960s to treat neurological disorders but also proved to be effective in paralyzing the facial muscles that cause "crow's feet" and frown wrinkles. Botulinum toxin, or Botox, was approved by the Food and Drug Administration (FDA) in April 2002 as a treatment for facial lines and wrinkles. Botox treatments must be repeated in approximately six months. Coherent ultrapulse carbon dioxide laser treatment is a promising new treatment alternative to traditional face lift procedures. As of 2003, this equipment has been used by a few major institutions. Some plastic surgeons have used a procedure called fat rebalancing to achieve outcomes similar to a traditional face lift procedure. Fat rebalancing involves relocation of fatty tissue from distant sites on the body to the face. Engler, Alan M. BodySculpture: Plastic Surgery of the Body for Men and Women, 2nd edition. Hudson Publishing, 2000. Man, Daniel, and L. C. Faye. New Art of Man: Faces of Plastic Surgery: Your Guide to the Latest Cosmetic Surgery Procedures , New York: BeautyArt Press, 2003. Papel, I. D., and S. S. Park. Facial Plastic and Reconstructive Surgery , 2nd edition. New York: Thieme Medical Publishers, 2000. Bisson, M. A., R. Grover, and A. O. Grobbelaar. "Long-term results of facial rejuvenation by carbon dioxide laser resurfacing using a quantitative method of assessment." British Journal of Plastic Surgery 55 (2002): 652–656. Byrd, H. S. and J. D. Burt. "Achieving aesthetic balance in the brow, eyelids, and midface." Plastic and Reconstructive Surgery 110 (2002): 926–939. Donofrio, L. M. "Fat rebalancing: the new 'Facelift'" Skin Therapy Letter 7 (2002): 7–9. Morgenstern, K. E. and J. A. Foster. "Advances in cosmetic oculoplastic surgery." Current Opinions in Ophthalmology 13 (2002): 324–330. American Society of Plastic and Reconstructive Surgeons. 444 E. Algonquin Rd., Arlington Heights, IL 60005. (847) 228-9900. http://www.plasticsurgery.org . Mayo Clinic. [cited March 23, 2003]. http://www.mayoclinic.org/facialcosmeticsurgery-jax/ . National Library of Medicine. [cited March 23, 2003]. <http://www.nlm.nih.gov/medlineplus/plasticcosmetic surgery.html> . Online Surgery. [cited March 23, 2003]. http://www.online surgery.com/procedures/face_lift.php . Face-lifts are performed by surgeons with specialized training in plastic and reconstructive surgery. They are most commonly performed in outpatient facilities or in private professional offices. The procedure may also be performed in a hospital. What will I look like after the surgery? How many face lifts has the surgeon performed? There is a sharp pain when I push up on the area where the incision was made for the strings.